Rabin-Karp Algorithm is a searching algorithm used specifically to search strings. Rabin-Karp is also known as Karp-Rabin algorithm. This algorithm is a string searching algorithm which was created by Richard M. Karp and Michael O. Rabin, Since it was created by these two scientists, It was named after the creator. Hence, Rabin-Karp algorithm. This Algorithm uses Hash data structure to find the string pattern. Where, The length of the text is n. The pattern of the test is p. Combined length of these texts ism. h(a,b) = x = 7. Since, h(ab) = 7, The pattern ab is found in the text. The Knuth-Morris-Pratt Algorithm also called KMP algorithm, is a string search algorithm. KMP algorithm searches a substring in a given string. Similar to a Rabin-Karp algorithm, This algorithm searches for a pattern in a given string. As the name implies, This algorithm was invented by three computer scientists namely Donald Knuth, Vaughan Pratt, James H. Morris in the year 1970 but was officially published in 1977. Example: Search the pattern in the given string using KMP Algorithm. Text	:	"abcxdabxabcdabcdabcy" Search pattern	:	"abcdabcy"
Here, We cannot directly compare the pattern with the text. 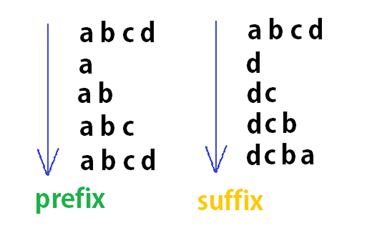 As KMP algorithm says we compare half of the pattern with prefix and suffix. 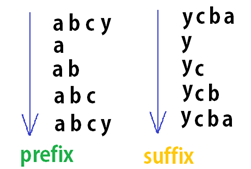 Start with first pattern (Prefix) and then with the last pattern(Suffix). Now, We do the same for other halves. MLA (Modern Language Association) "Types of Algorithm Laws." ScienceAid, scienceaid.net/Algorithm_Laws Accessed 20 Apr 2019. Chicago / Turabian ScienceAid.net. "Types of Algorithm Laws." Accessed Apr 20, 2019. https://scienceaid.net/Algorithm_Laws.